It’s time to break the cycle of boring date nights. 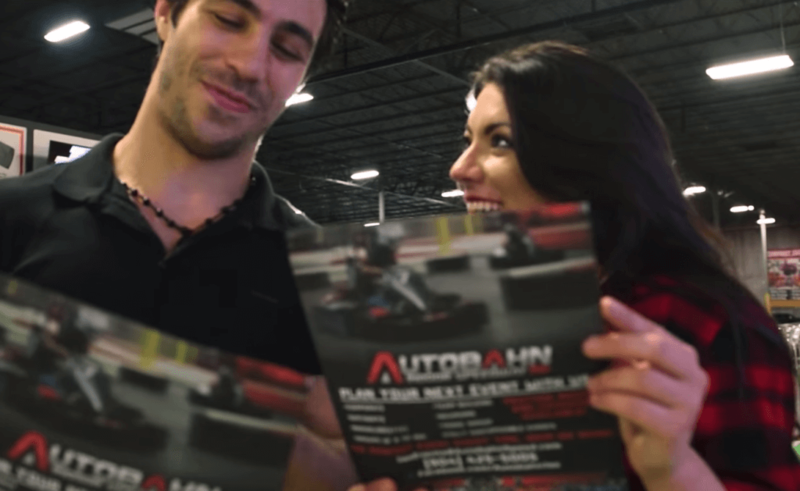 Whether you’re in an established relationship that could use a new date night idea or you’re taking someone on a first date and need a good way to impress them, racing at Autobahn is the perfect solution. One word: competition. Spice up your date nights by adding in a little competition. If you and your date are really competitive, this can be a great opportunity for you to see who’s the better racer. Put something on the line: winner picks the place for dinner, the loser buys the drinks afterward, etc. Plus, you can keep coming back to try to hold the title of Date Night Winner. It’s an opportunity to teach your date. Maybe the competition aspect doesn’t intrigue you, but what about an opportunity to teach your date a few things? Teaching each other new skills is a great way to grow closer and connect even more on a date night. It won’t break the bank. Date nights can get expensive, especially if you spring for some wine at dinner and a large popcorn for the movie. Autobahn doesn’t have to be expensive. We offer plenty of deals and specials throughout the week so you can get more racing for less. Find your location’s unique specials here. It’s different. How many couples do you know that see date night as a simple dinner and a movie? Not you! You like exciting date nights. Autobahn gives you a fun break from the norm and allows you to try something new. Adrenaline is the perfect addition to any date night! It can be last-minute. We never require reservations. All you have to do is arrive and drive. So bring on the spontaneous date nights! You won’t smell. We had to include this one… Because who wants to smell bad on a date? Many other fun, adventurous date night ideas will leave you smelling like sweat or other bad fumes. Autobahn is located inside an air conditioned facility, meaning you likely won’t break a sweat no matter how hard you go. Plus, our karts are electric, meaning you won’t smell like gas or exhaust afterwards. Next time date night rolls around, be sure to check out your local Autobahn track for a fun, new, and exciting date night idea. Our karts and tracks are equipped with the best of the best. Feel the thrill of 50 MPH Italian-made go-karts, but know you’re safe in our state-of-the-art facility. Find a list of all of our locations here and start planning your date night!